Note: This item originally appeared as a guest post on Eat Boutique. Make sure to check them out! There’s a first time for everything folks, and this was honestly the first time I’ve ever made deviled eggs from start to finish. I believe I may have assisted a friend while she put together a few dozen while helping prep for a dinner party, probably shelling eggs or something, but otherwise I’ve never had the pleasure. I’m generally not much of an egg aficionado. I can take them or leave them but occasionally I have a craving and that urge must be met. I assume it’s the protein luring me in with golden promises of post snacking energization. Some healthy foods really do tend to have their way with you, don’t they? So when I do make eggs I like them to be just a bit more than their traditional selves. Which is why this savory concoction of chutney, jalapeños, and garam masala caught my eye. That and the bright pop of crisp, fresh, bright red radishes sprinkled on top. But before we get to any sort of edible decorations I had to tackle the timeless issue of how-to successfully peel eggs so that they come out smooth and elegant instead of looking like a little mouse has been gnawing great bites out of them. I’ll readily admit that I had a few disastrous outcomes before I finally managed to wrangle six perfect eggs. I found myself frantically googling for tips and ideas trying not to get bits of shell all over my iPad but none of the ones I found were super helpful. By all means, if you have any great hard boiled egg tips in your bag of tricks please share them with me in the comments. Once the eggs were shelled though the rest of the dish is absolutely dead simple and involves finely mincing a few vegetables and combining all of the ingredients into a tasty red and green studded filling. I know a lot of people take the extra time to pipe the filling into their deviled eggs, but I actually like the little round mounds I ended up shaping with an extra small cookie scoop. They seem just a tad more authentic, don’t you think? Of course, what really matters in the end is how they taste. The slightly sweet garam masala gives these pretty eggs a startlingly unique flavor that I found addictive. Sweet, salty, savory, and spicy all rolled into one fetching bite which has definitely find a home in my appetizer rotation. Shell eggs, then cut in half lengthwise. Transfer yolks to small bowl and mash with fork. Mix in mayonnaise. Stir in onion, jalapeño, chutney, and garam masala. Season with salt and pepper. Spoon yolk mixture into whites. Top generously with chopped radishes. Cover loosely and refrigerate. 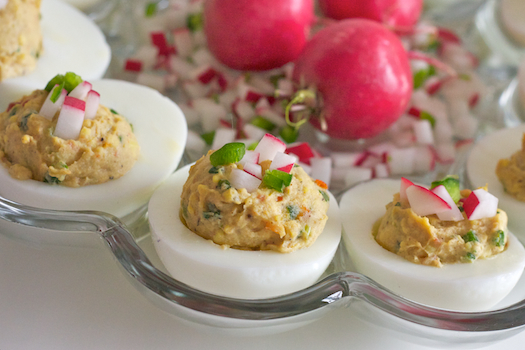 Now these sound like some flavorful deviled eggs! Thanks for sharing. There’s a rumor online with regards to easy egg pealing: cut the cooked egg in half and scoop the sucker out with a teaspoon, much like an avocado. 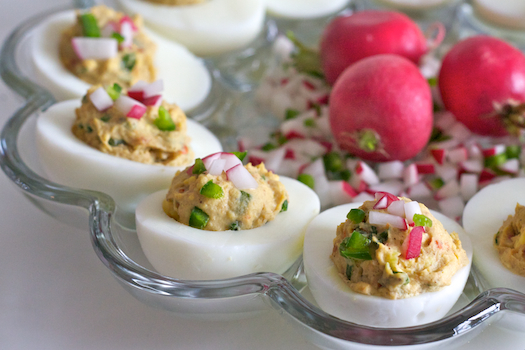 I love garam masala and deviled eggs, so can’t wait to try this recipe! I always cool my eggs immediately by running cold water over the pan and letting it sit. If you crack the wide end and rolll on the counter to completely break up the shell it helps to get the shell off with membrane and avoid the mouse munchie look. In my world one can not go wrong with Garam Masala and anything! That said, these eggs look adorable as well as sounding delish. This looks like a fun little recipe. I will give it a try over the next few days. My husband just loves deviled eggs so this will be a real surprise! OMG, a recipe that I could actually eat! I don’t do radishes though or chutney. The best way to get easy to peel eggs is to buy really old ones or let them sit in your fridge or on the counter for a week or two. Apparently people in Europe don’t refrigerate eggs at all. I buy Wal-mart eggs for making hard boiled eggs, they are guaranteed to be old enough. My deviled egg recipe only includes Miracle Whip and mustard. Sometimes I’ll use spicy mustard if I feel like it. 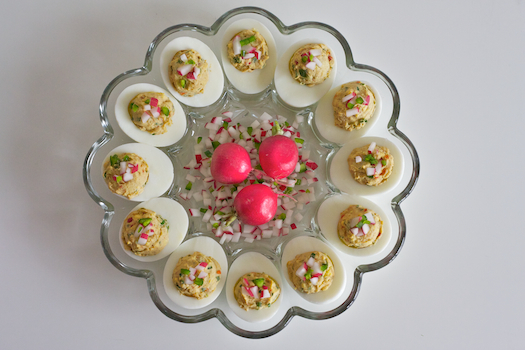 I am a huge fan of deviled eggs…and adding garam masala?! Ah, they look incredible. Especially in that gorgeous dish you have to hold them. I love your blog, the pictures are perfect!